MTH produces some finely-detailed 1/48 scale freight cars, including these Plate F hi-cube boxcars. Disassemble the car by removing the 4 door-track screws and the 4 carbody screws. Remove the factory trucks. Now cut small squares of .197 acrylic and epoxy to the top surface of the boxcar floor. These squares will never be seen by humans (other than yourself) so they need not be pretty. They only need to cover the large bolster-hole while fitting between the screws. Cutting squares with tin snips makes the work fast and easy. Once the epoxy sets, flip the car floor over and use a punch to mark the center of the large bolster hole. I lucked out in that the diameter of my punch matches that of the hole...this makes marking the exact center of the hole very easy! I find that placing the boxcar floor on a scrap piece of 2 x 4 works well. Now, drill a pilot hole using the small 3/32 bit. Then, drill a larger hole with the 11/64 bit. Clean up any plastic shavings around the holes. Cut threads into the holes by winding in a 10-32 tap. Take your time and be sure the tap is vertical. All that is left is to attach the Lionel trucks with 10-32 machine screws and reassemble the car. A big improvement! The narrow sideframes, rotating bearing caps, and fine tread wheels look amazing...at least to me anyway. Next up is building coupler yokes, striker plates and adding couplers...stay tuned! 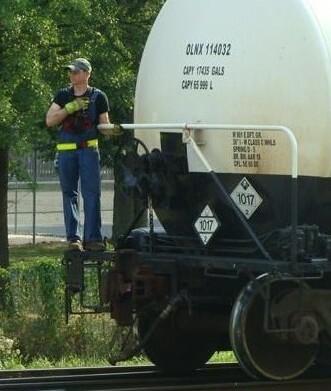 I like shifting railcars. Whether we are talking the real thing or simply models on a layout, I get a rush out of drilling cars into their proper order and spotting-up industries. Given a choice, I will take a switch-heavy job over a road job any day. Of course, some industries are more interesting to shift than others. In my opinion, switching interest = tracks available for shifting + number of specific car spots + variety. Let’s explore each parameter. Here we have everything needed using just three tracks and two switches! 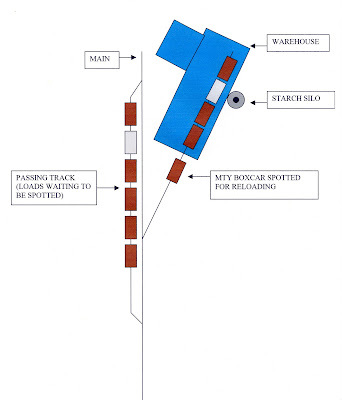 The passing siding (the track at left with boxcars) is used to store cars off-spot until needed. Crews dig cars out of the siding and drill them into spot-order using the main. Finally, loads/empties are swapped out on the customer’s spur. (Cars are spotted at the warehouse dock at the upper right of the photo) Simple huh? Number of Specific Car Spots: Multiple car spots add switching interest as you are now digging more cars out of the storage track (or your train). Locating a single boxcar amongst a string of cars on a siding is straightforward; digging three specific boxcars out of that same siding makes things interesting; finding three specific CSX boxcars amongst eight CSX cars on that siding makes things very interesting! The plant typically unloads four boxcars of pulpboard per day. Often, one or more boxcars are only partially unloaded and need to stay. The plant also receives a hopper car of starch every few days. Due to the location of the unloading hoses, starch cars must be the next-to-last car on the spur. Finally, the plant reloads previously emptied boxcars with scrap cardboard. These reloads get spotted on the spur in front of the dock. The plant will specify which empty car(s) at the dock are to be respotted for scrap loading. 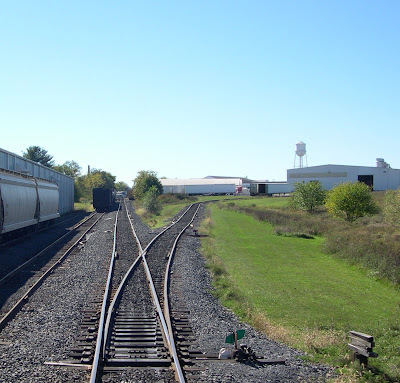 So, our single spur track now provides spots for loaded boxcars of paper; loaded covered hoppers of starch; and MTY boxcars to be reloaded with scrap cardboard. So that’s how a simple yet functional track plan, which serves a multiple car/commodity industry that calls for a variety of switching scenarios makes for a very interesting place to shift! Next up: Translating my modeling philosophy into a layout design…stay tuned!